Comments allow you to have a focused conversation with others around a particular task. Collaboration is easier when you can discuss the work at hand and have it automatically tracked and organized with the task to accomplish. To add a comment, click the comment icon on the desired task. The comments panel will open. Type in the box at the bottom of the panel and click the Comment button. You can also type shift-enter to save your comment. Tasks that have comments display the comment icon along with the number of comments. If you leave the Comments panel open, then Comments will be displayed for the current task. You can view details about the person who wrote a comment by hovering your mouse over their picture. To video chat with a person click the Start a Hangout button. You can edit comments you write by clicking the menu to the right of the comment and choosing Edit comment. Type shift-enter or click outside of the comment to save the changes. NOTE: You cannot edit other people's comments. You can delete your own comments by clicking the menu to the right of the comment and choosing Delete comment. NOTE: You cannot delete other people's comments. By default you are notified when people comment on tasks in shared queues and assigned tasks. Notifications are sent via email and web alerts. Read the Notifications Help Doc for complete details. 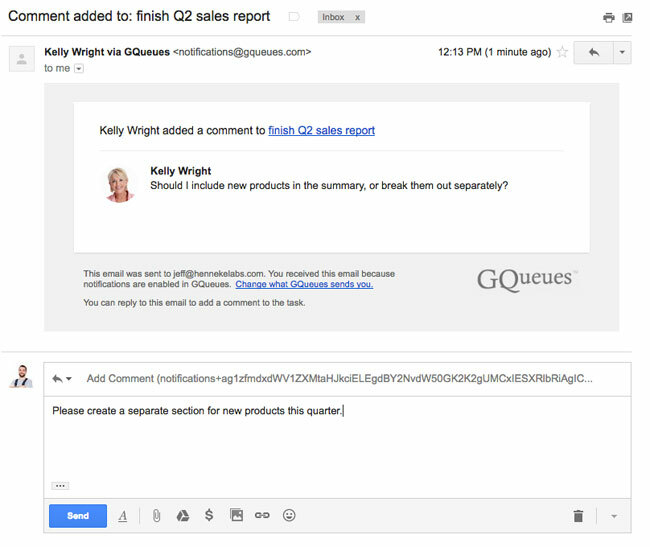 When you receive an email notification, you can reply directly to the email. Your reply will be added as a comment to the task automatically. Others will also be notified of your reply. You can resize the panel by clicking and dragging the separator bar.